OPEC meeting on output face threats to oil demand, oil supply shock coming? Group notes trade tension, monetary tightening, EM weakness. Ministers to review output at Sept. 23 meeting in Algiers -Play Video-Brent Hits $80: Oil Supply Shock Coming? 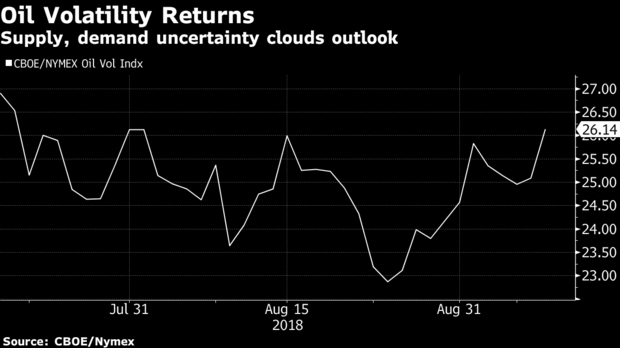 OPEC highlighted a range of risks brewing in the global economy that could hurt oil demand as ministers prepared for a meeting on production policy, marking a shift from last month's outlook. The Organization of Petroleum Exporting Countries, and allies led by Russia, will meet in Algiers later this month to assess world markets, having agreed to boost production at their last meeting in June. Oil prices are trading near their highest in two months in London, at almost $80 a barrel, as demand concerns arising from U.S.-China trade tensions are countered by supply losses from Iran to Venezuela. OPEC's report also forecast small cutbacks to oil demand, trimming estimates for growth in 2019 by 20,000 barrels a day to 1.41 million a day. Yet it pointed to looming dangers that could further impede consumption, such as fragility in the Argentine and Turkish economies, currency depreciation in India and rising protectionism. It's a marked shift in tone from last month's report, which noted that “healthy economic developments and increased industrial activity” would likely support demand for distillate fuels. Although this month's gathering in Algiers is a sub-committee review, rather than an full-scale official OPEC meeting, most major producers will attend. Supply data in the group's report indicated there could be tensions when ministers get together. Output slumped further in OPEC nation Iran, dropping by 150,000 barrels a day to 3.58 million a day in August. Saudi Arabia -- the organization's biggest producer -- bolstered supplies again to 10.4 million a day, according to the report. The two nations remain sharply divided over the details of the agreement reached in June. The Saudis, supported by other Gulf nations and Russia, said that OPEC had agreed to add about 1 million barrels a day to world markets. 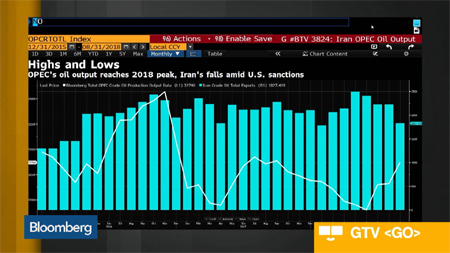 On the other hand, Iran, which is seeing its supply pressured by U.S. sanctions, contends that the boost agreed was much smaller, and has complained about increases by fellow members. The output additions by the Saudis over the past few months, filling in the gap left by Iran, will almost certainly arise in the talks scheduled for Sept. 23 in the Algerian capital. Story by Gran Smith from Bloomberg News.